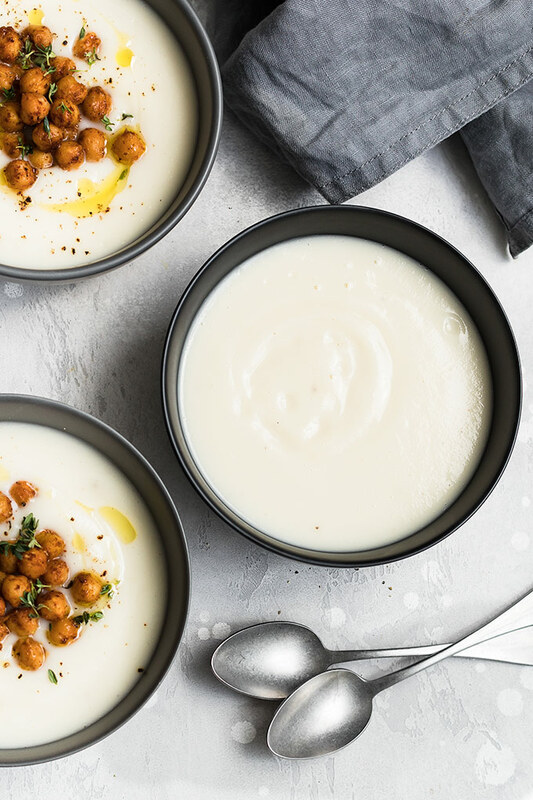 This creamy cauliflower soup is filling, rich, and so incredibly comforting and easy to make. Bonus? It’s also naturally gluten-free and vegan. You won’t miss the milk and cream at all! 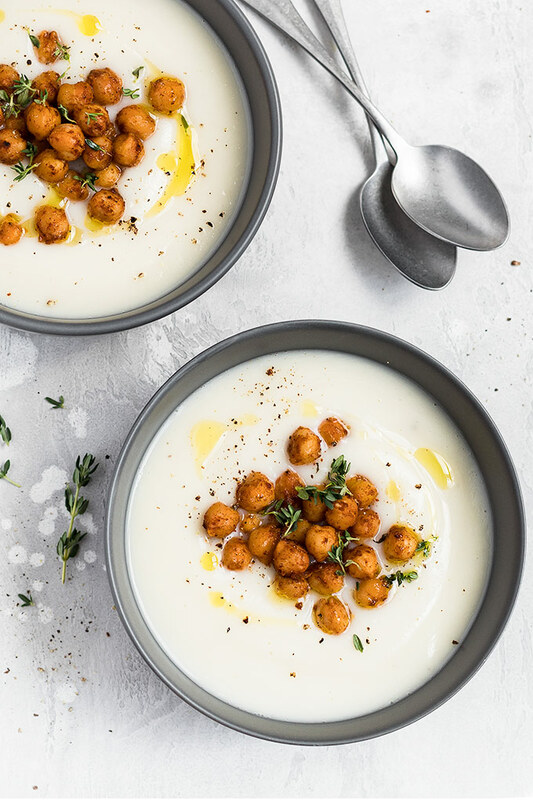 This healthy cauliflower soup is perfect for when you’re craving something warm, and comforting. No cream, milk, potatoes, or thickeners required. 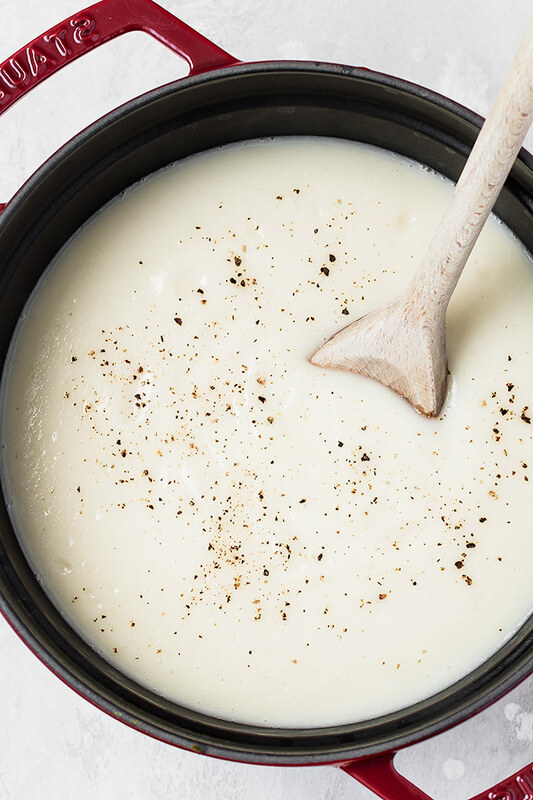 The natural texture of cooked cauliflower blends into a thick, silky, nutrient-rich soup. Low-sodium vegetable stock – I used my homemade vegetable stock powder, feel free to use chicken stock. Sautée the garlic and onion until softened. Add the cauliflower, vegetable stock, and thyme sprigs. Let everything simmer until the cauliflower is tender. Puree the ingredients right in the pot with an immersion blender, or transfer the soup to a traditional blender in batches and blend until it’s smooth. Add the toppings and done! This velvety smooth and SO delicious soup will be ready to serve. If your soup is too thick after blending, thin it out with some more vegetable stock. If it’s too thin, bring it back to a simmer and cook until it has reached your desired consistency. I topped my bowls with roasted chickpeas, chopped fresh thyme and a drizzle of extra virgin olive oil to finish it off. Roasted chickpeas add texture and crunch. Toasted nuts/seeds, croutons, chives, parsley, truffle oil,….are also great additions. If you want to treat yourself, stir in a dollop of cream or Greek yogurt. Toss the chickpeas in a simple mixture of salt, paprika, chili powder, and cumin, and roast them for 25 minutes. The result is a tender chickpea with a slightly crispy edge and a spicy-smoky flavor. 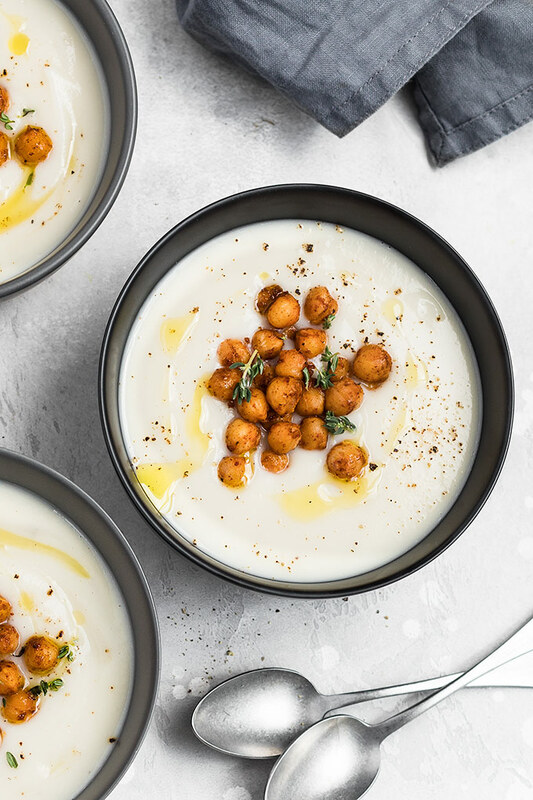 I advise you to make a double batch of these chickpeas because they’re also a fabulous snack. Make it spicy: add a generous sprinkle of crushed red pepper flakes to this soup before serving to give it a bit of a kick. Fresh Herbs: use rosemary, sage, or oregano instead of thyme. Add in some extra veggies: feel free to toss in a handful of chopped broccoli along with the cauliflower. Cauliflower soup can be made in advance and reheated when needed. It will keep for up to four days in the fridge in an airtight container, and it can be frozen for up to a month. This would make the perfect light yet satisfying meal when you want something on the table fast. It’s also a perfect make-ahead meal. Prepare the soup and portion it into containers for the week. For more easy soup recipes, check out my Creamy Broccoli White Bean Soup, Healthy Zucchini Avocado Soup, Ginger and Turmeric Carrot Soup, Roasted Pumpkin Apple Soup, and Thai Butternut Squash Soup. 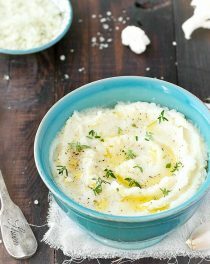 And, for more healthy recipes with cauliflower, check out my Cauliflower Mashed Potatoes and Cauliflower Fried Rice, and Roasted Cauliflower “Hummus”. Heat the olive oil in a large pot over medium-high heat. Add the onion and sautée for 5 minutes, until soft and translucent, stirring occasionally. Stir in the garlic and continue to sautée for 1 more minute, until fragrant. Add the chopped cauliflower and thyme and cook for about 3 minutes, stirring often. Cover with vegetable stock and simmer on medium heat for about 15 minutes, until the cauliflower is very soft. Remove from heat, add salt and pepper to taste and carefully blend until smooth using a blender, a food processor or an immersion blender. Add more stock for a thinner consistency. 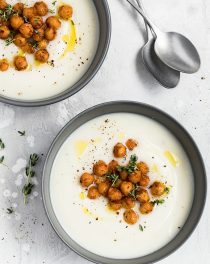 Serve the cauliflower soup in bowls topped with roasted chickpeas and garnished with chopped fresh thyme, a drizzle of extra virgin olive oil, and freshly ground black pepper. Pat the chickpeas dry with paper towels and place them in a large bowl. Toss with olive oil, paprika, chili powder, cumin, and salt until evenly coated. Spread the chickpeas in a single layer on a baking sheet and bake for 20-25 minutes, stirring occasionally to prevent over browning. 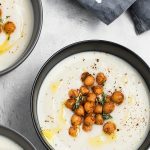 The chickpeas are done when they are crispy and golden brown. 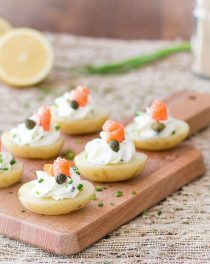 *Nutrition information is a rough estimate for 1 of 4 servings with all of the recommended ingredients but no toppings / garnishes. I AM SO GLAD THAT I FOUND A SITE THAT IS THA INCLUDE THE NUTRITIONAL VALUES WITH THE RECIPES THANKS SO MUCH. Yeah!! I will post our site on my face book page for my friends to find. Can i use chicken stock instead of vegetable? Tried this today!Had to add more olive oil,but was stunning!! Didn’t have any thyme,so used mixed herbs instead!Even my hubby loved it!! This looks so silky and delicious. I was looking for a healthy soup and this is it. I’m going to make it soon. It looks so good, I can’t wait to try it. Can we store it right after? I do a lot of prep meals? How long in the fridge? 2-3 days? You can store the soup in the fridge for up to 4 days or in the freezer for up to 1 month. Made this soup! It’s wonderful, I used roasted hazelnuts and chili oil then some Parmesan shavings. It’s delicious . 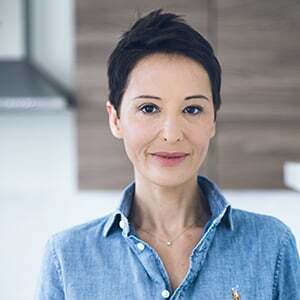 Hello l haven’t tried any of your recipes yet, but l know they will be amazing. I’m transitioning into becoming Vegan and l was looking for something with natural ingredients instead of all the creams, milk and butter. After reading a few of your recipes l knew this is what i’m looking for. Hi Debora! 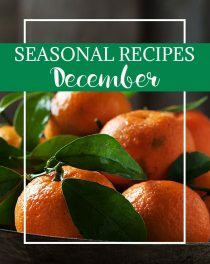 Although this is not a vegan blog, I have lots of vegan recipes, especially soups, salads, and some desserts. 🙂 If you have any request feel free to send me a message anytime. I made this tonight as a part of my meal prep and it turned out amazing and very easy and simple which is what I like, I used chicken stock instead of the vegetable stock and the onion and garlic really compliment it well.